The critically endangered Peacock Tarantula is one of the many arachnids featured in "The Art and Science of Arachnids" at the Swaner EcoCenter. Of all the creatures on the planet, none can make the hairs on your neck stand-up and give you the heebie-jeebies quite like spiders. With their eight creepy legs, orbed eyes, arced fangs, and web-spinning ways, they easily qualify as alien. Perhaps, this is why we so often view them as villains, from the smallest (and innocuous) house-dwelling spiders to the malevolent, gigantic beasts only found in fantasy. Despite their infamy, however, spiders and arachnids in general are extremely fascinating, diverse, and essential to countless ecosystems. You can delve into their world through "The Art and Science of Arachnids" exhibit at the Swaner EcoCenter, from now until December 9. To get ready for close-up encounters, here are a few things you may not know about spiders and the class Arachnida. Spiders are not the only type of arachnid. Scorpions, harvestmen, pseudoscorpions, whip scorpions, mites, and ticks are also part of the arachnid family. The word "arachnid" comes from Greek mythology. Arachne was a gifted weaver who challenged the goddess Athena to a weaving contest. Arachne's superior weaving and her pride caused Athena to curse Arachne. In her despair, Arachne hung herself. Athena brought Arachne back to life and transformed her into a spider as punishment for insulting the gods. All spiders make silk, but only about half use that silk to make webs to catch prey. Spiders also hunt and wait for their prey, which sometimes includes other spiders. While insects have three distinct body segments, arachnids have two. Arachnids have a cephalothorax, an abdomen, and eight legs (insects have six); mites vary and may have eight, six, or even four legs. 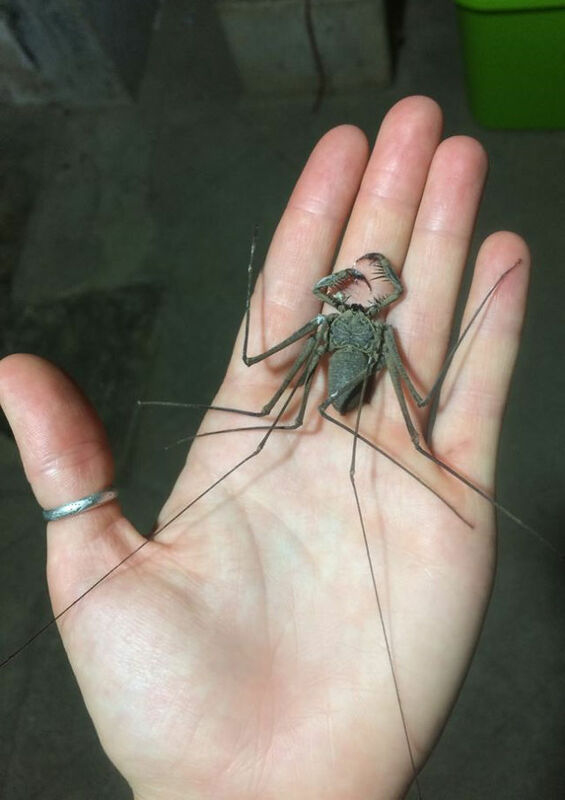 The tailless whip scorpion looks scary, but is harmless to humans; earning this arachnid a starring role in the fourth Harry Potter film! Spider legs are a great example of hydraulics in action. Spiders have a strong exoskeleton and their bodies are filled with a blood-like fluid called hemolymph. To move, they rapidly increase pressure in their cephalothorax to send hemolymph flowing to the extremities, causing the legs to stretch outward. When moving, spiders innately increase and decrease body pressure in fractions of a second to quickly skitter about. When a spider dies, their legs curl up because they have lost that hydrostatic pressure from the hemolymph and have "deflated." Many species are named after famous musicians. Heteropoda davidbowie is a Hunstman spider from Malaysia, named after David Bowie in 2008. Pachygatha zappa is an Orb Weaver spider named after Frank Zappa. It was discovered on Mount Cameroon in 1994. Most tarantulas are non-aggressive towards humans. 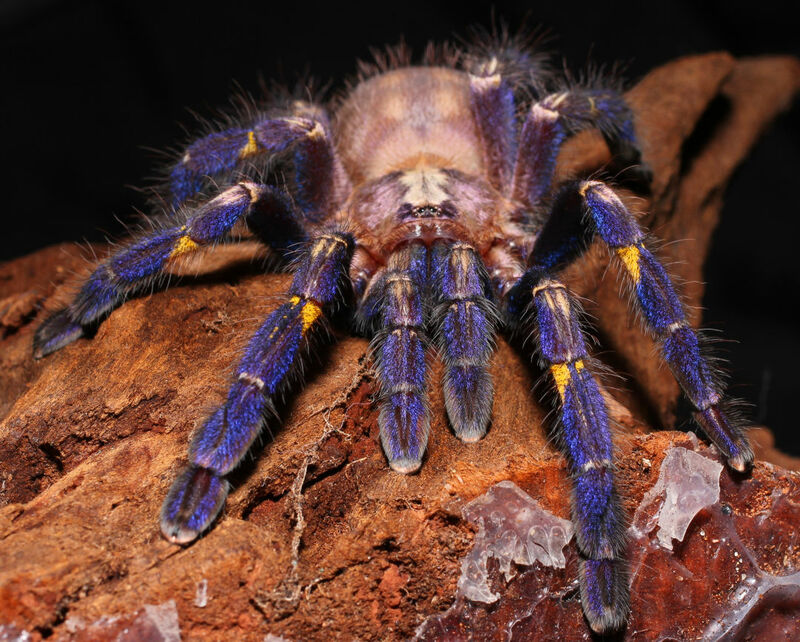 The first line of defense for many tarantulas is throwing urticating hairs, instead of biting. These hairs can cause irritation and discomfort similar to stinging nettles. The spiders we find in our house are great pest controllers. Household spiders prey on mosquitos, flies, earwigs, and moths! This keeps pest numbers down indoors and even helps prevent the spread of disease. So even if you are scared of them, you shouldn't kill house spiders. Many arachnid venoms are used in modern medicine. From chronic pain to cancer, scientific research is finding new ways that venom can be used to improve human health. Scorpion venom, for example, may help with multiple sclerosis, cancer, heart transplants, and Rheumatoid Arthritis. Ready for more arachnid facts? Then, get over to the Swaner EcoCenter and check out the amazing exhibit! Admission is $7 for adults, $4 for kids ages 3-12, and free for kids 2 and under (and free for members). Not only will you learn new and interesting facts, you can also meet 100 species in person, including the Dictator Scorpion, the largest scorpion in the world, and the critically-endangered and brightly colored Peacock Tarantula. And if you're feeling a bit creeped out, remember, this can be a great prequel to Halloween!